Send me an email telling how a woman in your life has most inspired or influenced you. What great piece of advice has she shared, or attitude would you like model? I'll post entries in future updates to encourage each of us. 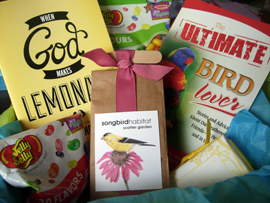 Box contains: The Ultimate Bird Lover book, Songbird Habitat Scatter Garden, When God Makes Lemonade book, Beans from Jelly Belly, & Lemon Verbena Gardener's Soap. My sister-in-law has a saying I've embraced. "If you don't use it bless someone else." Last year we replaced the carpet in our house. Forced to face our pack-rat ways we emptied every closet. Staring at a mound of boxes piled from floor to ceiling in our living room I cried and told Loren, "I don't ever want to have this much stuff again." As a result, I parted with many items dear to me, but which had outlived their purpose and space in my life. My daughter was thrilled when I gave her the set of Little House on the Prairie books I received at age fourteen for Christmas. They're the same books I read to her and her brothers, and now she can't wait to share them with her own children. To my oldest grandson, an avid historian, I gave The First Book of American History published in the early 1800's. Our adult children sorted through boxes and what they didn't take went to the Goodwill. I entrusted treasured family keepsakes to the next generation. I let go of the old and opened my life up for new possibilities. Beat eggs in a medium bowl until light. Add flour, salt, and milk; mix well. Set aside. Place butter in a 12 inch cast iron skillet. Warm on burner over low heat just until butter melts, (take care when using glass top stoves). Tilt pan to thoroughly coat sides and bottom. Pour egg batter into skillet. Bake at 450* for 15 minutes. Reduce heat to 350* and bake 5 minutes. Remove from oven. Don't be alarmed, cake puffs up into weird shapes. That's part of the fun. Sprinkle fresh lemon juice over cake and dust with powdered sugar. 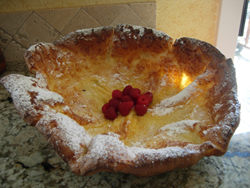 Serve from the skillet or lift out onto a plate. I serve this with a generous dollop of Raspberry Cream. Mix 1 cup fresh sweetened whipped cream with ¼ cup mashed fresh raspberries. Garnish with whole raspberries & a bit of lemon zest. Serve immediately. Add a side plate of bacon or link sausage to make a delicious Mother's Day brunch! 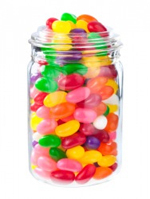 April 22 marks National Jelly Bean Day! Who can't help to smile when they see gobs of colorful jelly beans? The earliest reference to jelly beans is associated with Boston candy maker William Schrafft who urged people to send his jelly beans to Union soldiers fighting in the Civil War. More than 3 tons of jelly beans were distributed at President Reagan's 1981 inauguration. The Jelly Belly company created a new flavor for the event, blueberry. The Jelly Belly factory makes over 50 official flavors plus a rainbow of specialty flavors. A misshapen jelly bean is called a Belly Flop. People eat 14 billion Jelly Belly Beans a year, with 5 billion sold at Easter. Visit the ideas & fun stuff pages at www.jellybelly.com for gifts & creative jelly bean treats. Bonnie - Tackle clutter. One pile at a time! One drawer at a time. Seeing the whole mess? Crippling. Just start. time. Just start. Just let God start. It seems insurmountable at first. Daunting. it out with God. Sometimes I do too much of the talking, but if I listen He always has something to say and I return refreshed. Linda - Every year our church holds a rummage sale and it is my chance to go through the house and find things to donate. 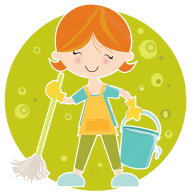 It is going for a good cause and it helps me on a yearly basis to de-clutter. The months in between I give items to a group that asks for donations which helps to create jobs for those with disabilities and items for the less fortunate to buy for very little money. I am thankful for both of these opportunities to recycle unused items. Cindy - Recently, I had unforgiveness in my heart and was unable to function in a productive manner. I couldn't seem to get out of the funk I found myself in. I was bound by this evil in my heart and it was only in releasing it and forgiving that I was able to move forward. I began gardening again and found solace in nature because it made me feel closer to God.